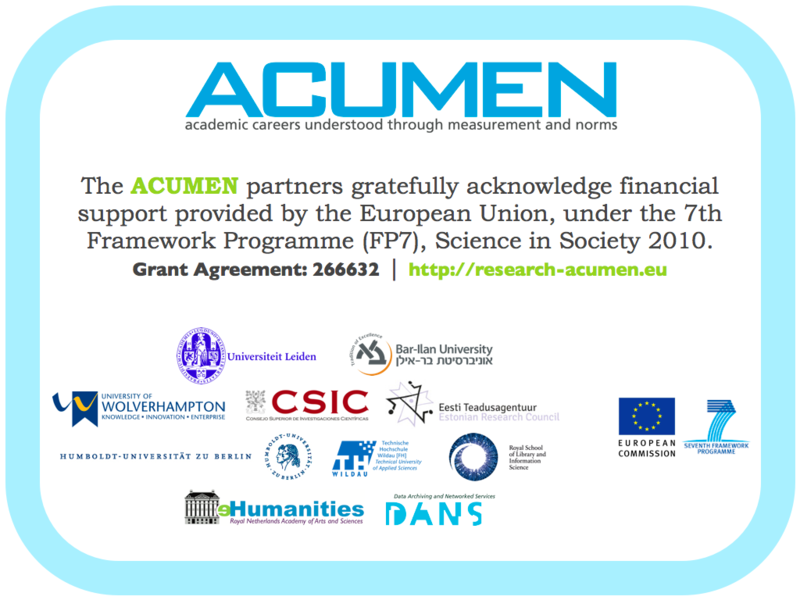 Academic Careers Understood through Measurement and Norms (ACUMEN) is a European research collaboration aimed at understanding the ways in which researchers are evaluated by their peers and by institutions, and at assessing how the science system can be improved and enhanced. This FP7 project is a cooperation among several European research institutes with Professor Paul Wouters (CWTS – Leiden University) as principal investigator. Assessment of the performance of individual researchers is the cornerstone of the scientific and scholarly workforce. It shapes the quality and relevance of knowledge production in science, technology and innovation. Currently, there is a discrepancy between the criteria used in performance assessment and the broader social and economic function of scientific and scholarly research. Additional problems in the current evaluation system are: lack of resources for qualitative evaluation due to increased scale of research; available quantitative measures are often not applicable at the individual level; there is a lack of recognition for new types of work that researchers need to perform. As a result, the broader social functions of the scientific system are often not included in its quality control mechanisms. and a comparative analysis of the implications of current and emerging evaluation practices for the career development of women researchers. ACUMEN is an integrated, comparative study in which a set of proven methods will be used on the basis of selections from one shared data set: a sample of European Research Area personnel from bibliographic and web databases as well as data harvested from websites, and data gathered through interviews and from citation indexes.